All who frequent the MSOG E-mail forum will know the name Tom Smith. Tom has been a participant since its conception and continues to this day to be a source of information. Tom bought Chukar in 2000. 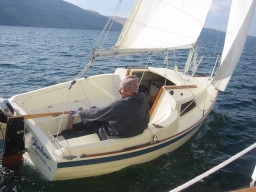 He's been sailing various craft since the very early 80's and has taken Chukar to lots of locations in the Northwest. I met Tom when he purchased M17 #496 in the fall of 2005. He and partner Jane Van Winkle drove just about exactly half way (300 + miles) to pick her up and towed her back to his home in Washington with his 4 cylinder (22re)Toyota pickup. With two Montys in the barn, it's now reluctantly time to part with the M15 known as Chukar. Chukar has been sold to John Byk and will be sailed on Lake Superior. Sail Inventory: All of the originals to include main, jib and Genoa plus (year 2000) crisp, like new Kern Ferguson's to include Mainsail with single reef, 155 Genoa, 110 working jib, light air drifter, spinnaker (new), and never used storm jib. Rigging: All new running rigging with halyards and sheets run aft for easy single handing. All new standing rigging custom made in 2003 by the master himself Jerry Montgomery. Appearance: Toe rails and exterior wood refinished in 2004. Kick up rudder bright varnished in 2004 and remains in excellent condition. New three piece teak - ply hatch boards special ordered from Montgomery Boats. Also have new windows (not installed). Over all she is in excellent condition and shows very, very well from mast to keel. Trailer: Professionally sandblasted to bare metal and repainted in bright white. Five foot tongue extension for easy launching. Bearing Buddies installed for protection. New bunk boards with carpet, new road and spare tires and all new wiring and lights. Misc: 2000 Honda 2 hp - 4stroke motor with only five hours of use, masthead Windex, new Harken swivel base/cam mainsheet control, Genoa track/stand up blocks on toerail, boom vang, flying Scott Cunningham, bow chocks, mast crutch, solid spinnaker pole, jib/Genoa downhaul, spinnaker sheet blocks at the aft end of the toe rails, New oversized jib and main halyard cleats, West Marine twist lock boat hook and the original Porta Poti which appears to have never been used.